Gaggle Mail works for you. Stay better connected than ever before with a simple, private group email address that you can trust. Keep everyone on the same page with, easy to use, group email for your club - large or small. Whether local, national, or international - make running the communication across your organisation a breeze. No more having to remember a bunch of email addresses or people getting left out when someone doesn't click 'Reply to all'. Whether you have one group or hundreds, we make setting up and running your group email a breeze. 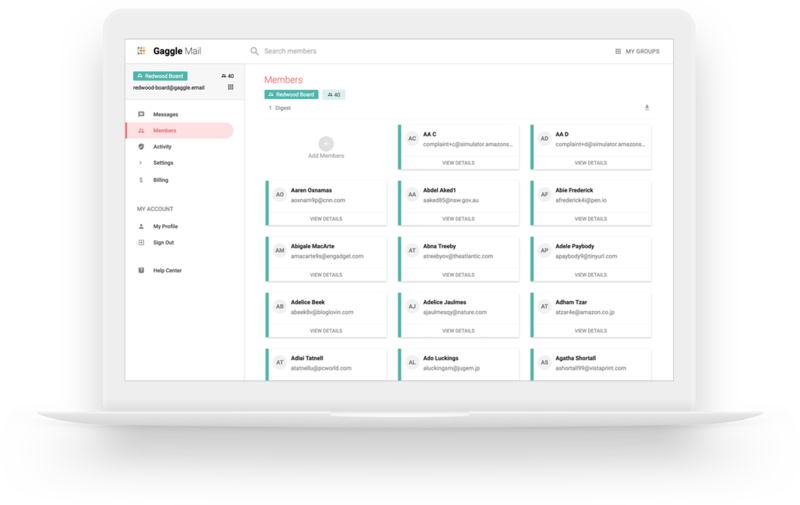 There's lots of ways to customise your groups but Gaggle Mail was built with simplicity in mind — so get started today with group email that you and your members will love! Have all messages at your fingertips with a fully seachable message archive. Use your own domain for your group address in a few simple steps. Enable moderation of messages, set who should be moderatored and who does the moderation. Allow your members to choose to receive messages in a handy daily digest. Easily import people into your group with either copy & paste or from a spreadsheet. Include your own personalised footer in every message sent via the group. Prepare your own personal welcome message for when people join your group. Enable a simple web form which people can use to join your group. Link groups together to manage members across multiple groups from one place. Pay per month or annually with single and unlimited group billing. Allow members to communicate without knowing each other's email address. Have a complete audit of everything that goes on with your group. Whatever the size of your group our simple, affordable prices always give great value. Start with a free 14 day trial. Our mission is to build the world’s most simple and reliable group email platform — we make group email available to everyone who needs it.